Between scrumptious samplings, you’ll be treated to a local’s knowledge of Ithaca’s history and culture. Your expert guide will share their love for their hometown as they showcase a historic high school-turned mall, the largest permanent exhibit in the world, public art, a city park in a parking space, and so much more. 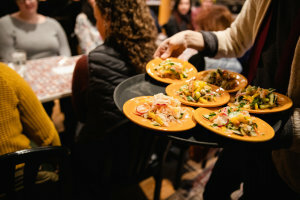 Whether you’re a first time visitor or a lifelong “townie” we guarantee that you’ll walk away with a satiated appetite and a new perspective on Ithaca’s culture, cuisine, and community.